The Cooler Master RC-690-KKN1-GP is designed to keep your system cool, no matter how hard you work it. The top and front are made of a metal mesh to facilitate airflow. Three 120mm fans are installed at the factory, in the front, rear and side. There is room for four more, two on the top, and one each on the bottom and side. You can also add an 80mm fan to the back of the motherboard tray to cool the CPU from both sides. Each of the five external bays has the same mesh cover and the 5.25" to 3.5" adapter is also. All of the bays have a tool-less design for easy installation. The removable hard drive racks are also tool-less and come with anti-vibration pads for decreased noise. Each of the expansion slots has its own lockdown lever to eliminate screws. Cable routing clips minimize clutter and increase airflow. To keep the case’s design lines pure the two USB, one FireWire, one eSATA and two audio ports have been put on the top of the case. This also makes them easier to access if the case is beside your desk. The power and reset buttons have been mounted on the side of the front bezel for the same reason. Superior Expandability with 10 Drive Bays Boasting five external 5.25" drive bays and five internal 3.5" drive bays, the Cooler Master CM 690 provides superior expandability. With the included 5.25"-to-3.5" converter, easily mount an external 3.5" device on the chassis. Excellent Cooling System The Cooler Master CM 690 features three 120mm fans (front, rear and side), as well as front and top mesh panels for maximum airflow and enhanced heat dissipation. The chassis also supports mounting of three additional 120mm fans for the ultimate cooling performance. Tool Free Installation The tool-free design ensures quick installation or upgrade for expansion cards, 5.25" and 3.5" devices, so you can save the time spent on setting up and start enjoying computing as soon as possible. Convenient Top I/O Panel The Cooler Master CM 690 features a convenient top I/O panel for easy access to two USB 2.0 ports, one IEEE 1394a port, one eSATA port and two audio ports. NVIDIA SLI Ready The NVIDIA SLI-ready Cooler Master CM 690 provides sufficient interior space and effective cooling for building up a high-performance dual graphics card system. 20.65" x 8.39" x 18.98"
Pros: I've had this case for 8 years, and put 3 or 4 different builds and configurations in it over that time. It's no longer my main case, as I have fallen in love with the build and sleek minimalist qualities of Fractal cases, but I have passed this around my family; to my wife, and son, and daughter, for various builds of theirs, and it's always performed well. Cons: Only cons would be that the design is from 10 years ago.. 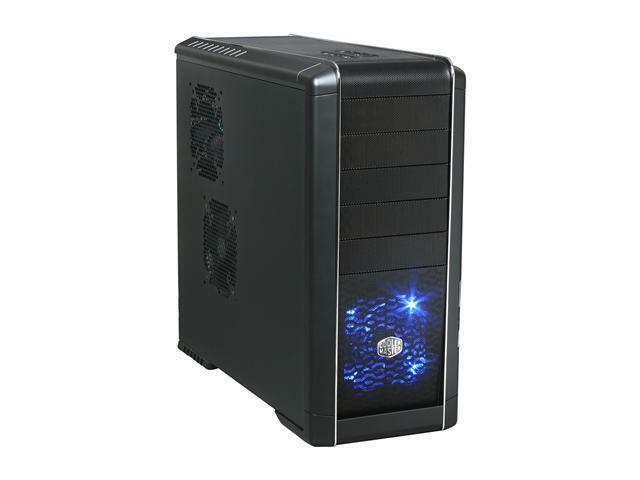 I'm not sure if they even still sell this model, or if they have newer ones with newer features - it's just lacking some of the newer case features seen in the past 5 years or so of course, since it's old, but still works great for ATX and general builds (never tried water cooling with it though). Pros: Fast forward from 2007 to 2016 and this case is still in use. Three power supplies have passed through it and an equal number of motherboards. Holds a big Noctua 14 HSF and had room for a GTX 1070. The five 120mm fans have kept it nice and cool. Cons: There were no bugs or defects. Other Thoughts: Guess the firewire port was unnecessary, but who knew that back when? This Cooler Master case (followed by the current HAF series) ended up being a best buy. Pros: First build was very nice and easy thinking this was a great buy. Cons: After a few years, the plastic pieces became exceedingly brittle to the touch - braking easily. This rendered the hard drive bays useless and the quick latches for the dvd drives short lived. Other Thoughts: Only replaced parts in this once or twice, so very disjointed with the that the product did not last the test of time. If it would have lasted, the ease and convenience of the case would have made it a real winner. Pros: I bought this back in 2009 and no issues whatsoever. It is solid and very dependable. The amount of internal drives you can add is amazing. Overall I am very happy with the case. Cons: Not must accept where to get more drive trays?? I only have 2. The power button is flaky at times, but not an issue. Too bad they dont make them anymore. Other Thoughts: None that I can think of. Pros: Case is Solid, sleek, simple design. Lost of Room, tool-less features makes for quick flawless install. Cons: After about a Year of normal use, the Power Button on the Case failed. If it wasn't for a Fail-Switch on my mother board, I probably would've spent countless hours and $$$ trying to find the problem (First guess is typically the MoBo or HDD/SDD). Pros: This case was easy to place all that I needed into it. It has great clearance between all of the parts and wires. Plenty of space for upgrades. Great flow design for cooling. Cons: cable management was sketchy. Other Thoughts: Having filters added to it would be better.